While there are some people who go blind overnight or in a matter of days, such as with detached retinas, following eye surgeries, or with certain types of Glaucoma, the vast majority of people with degenerative diseases such as Retinitis Pigmentosa and Macular Degeneration, lose their sight gradually, over a period of many years. Just because our vision changes doesn’t mean our interests do. Some people assume that certain hobbies that are sight-related, such as sports, fashion, makeup, woodworking, etc are no longer interesting or feasible after vision loss. This simply isn’t true. There’s nothing worse than a group of friends assuming that you no longer want to go on your annual bike-riding trip, aren’t interested in watching a football game together, or don’t enjoy shopping with them anymore. Yes, some things may change, such as needing to use a tandem bicycle or a tether for running side-by-side or audio descriptions for movies, but these activities can still be very fun. There are always ways to compensate and adapt when it comes to the activities we love. I have a friend who is completely blind from RP and recently refinished his basement alongside his son, even handcrafting a beautiful wet bar, all without sight. I’ve heard of auto mechanics who can no longer drive but still find ways to work on cars. When someone has a talent or interest, they find a way to continue doing it. It can feel socially isolating. Think of all the social interactions that you use your vision for, from greeting your neighbor across the way to commenting on someone’s clothing. From college students bonding over late night activities around campus to parents observing their kids’ soccer games, some of these experiences can feel a bit awkward for people losing their vision. While we can still participate in many of the same activities, some of the commentary involved in a shared visual experience is missed. Sometimes we feel like we have to fake “ooh-ing” and “aw-ing” over that cute or funny scene everyone is pointing at, lest we feel out of the loop. We can’t dart from person to person at a party, spotting friends across the room. Some of this is unavoidable, but friends and family who go out of their way in social settings can make a huge difference. Even when we can’t spot you in public, we still appreciate being acknowledged and greeted. For example. I love it when a parent of someone in my daughter’s kindergarten class comes up to me in the grocery store and tells me who they are, even if I’ve met them before, and starts a conversation. I can’t stand it when someone tells me, after the fact, that they were near me in a public setting, “Oh, I saw you at the movie theater last week,” but didn’t make their presence known at the time. It’s a weird feeling when people can spot you but you’re not able to see them. It can leave you feeling self-conscious and awkward. When someone passes me and just says, “Hi Joy!” without identifying themselves, I sometimes spend the next 10 minutes trying to figure out who it was. On the flip side, when someone says, “Hi Joy, it’s Lindsay!” I can ask how her daughter is or spout off a relevant comment, which is what people who are fully sighted do regularly in their social lives without even thinking about it. The things we can and cannot see are sometimes confusing, even for us. I can’t always explain why I can’t figure out what a picture that someone texts me is of but can read the print caption that goes along with the photo. Perhaps it has something to do with visual memory of letters and how my brain fills in the gaps, even when parts of those letters are missing. Or maybe it’s the contrast or the size and color of the photo that makes a difference. Whatever it is, it can be difficult to explain to people and could even appear phony, like I have “selective sight”, but anyone who knows me well understands and doesn’t give it a second thought. My younger sister, who works on a cruise ship, overheard one of her coworkers complaining about a passenger who had requested vision-related assistance but then appeared to be looking at something. The co-worker assumed the person was lying about their poor eyesight, but my sister grew up watching her 2 older twin sisters struggle with vision loss and quickly told her co-worker that the passenger might need help seeing some things but not others. 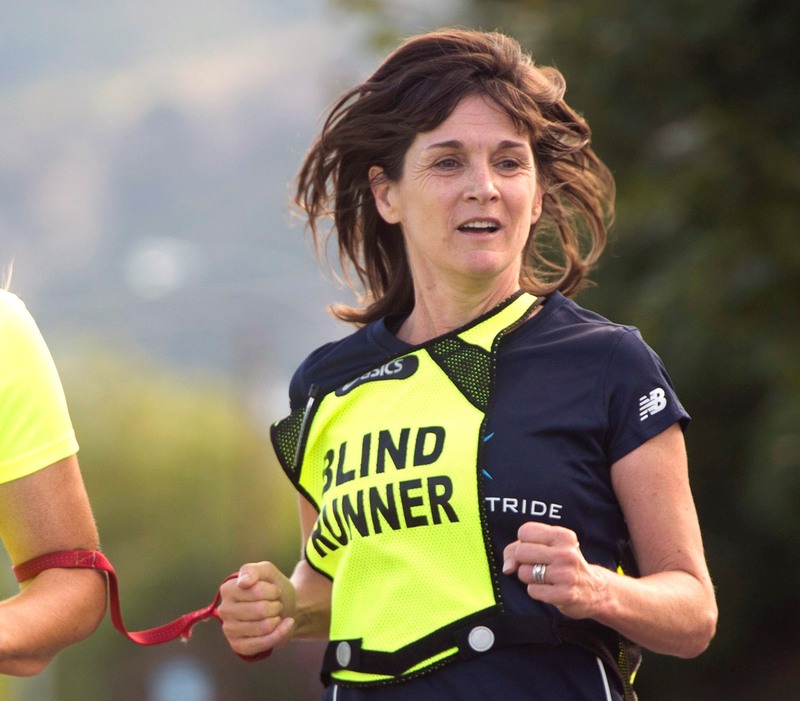 Vision loss is not always a concrete, black-and-white picture for people losing their sight. Take colors, for example, I can identify most colors in a general sense but often can’t distinguish between blue and green, red and orange, purple and brown, or even between yellow and white. We can have “bad” and “good” vision days. Sometimes it depends on how sunny or cloudy it is outside. Other times it depends on eye strain, the time of day, lighting inside vs. outside, and even how many trees or landscaping are around casting shadows, causing my eyes to play lots and lots of tricks on me. It’s not something most of us dwell on daily. Gradual degeneration is a lot like aging. You don’t look in the mirror every single day, inspecting every new wrinkle, exclaiming, “I’m getting older!” just like I don’t stare at eye charts constantly, noticing every little change. Also similar to aging, most people don’t just wake up one day and realize that they’re a senior citizen….you realize that you’re aging at various points in your life, sometimes because of an event such as a milestone birthday, but other times you just notice yourself looking or feeling older from time to time. Typically, vision loss is similar. There are times I’ve gone to the eye doctor and been surprised at my change in vision because I hadn’t noticed it happening to the extent that it dropped, despite the fact that I could tell it was worsening. Other times, I notice the drop and am not surprised in the least when the Ophthalmologist shows me my test results. Some of us use mobility aids like canes and dogs and some of us don’t. There are people who have the exact same vision who move about the world completely differently. There can be 2 people who both have 19 degrees of vision, deeming them both “legally” blind, and one of them uses a white cane while the other walks around without any mobility tool. 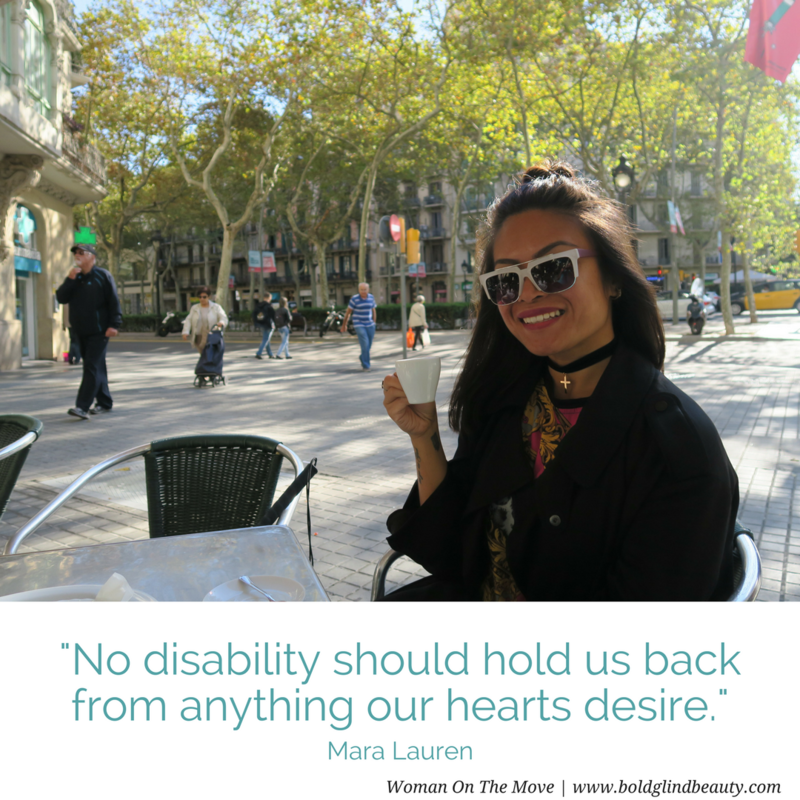 If there is someone in your life who you feel like should be using a mobility assistance but doesn’t, it’s usually a realization they need to come to on their own, something through a few bumps, bruises and embarrassing moments. No one can be persuaded through guilt or fear to get assistance. Even among those who are completely blind, not everyone uses a cane or dog. Some, for example, use echolocation. It’s a personal preference. A common misconception when someone begins using a cane is that they just had a major drop in their vision. Sometimes this is the case, but many times the person is just sick of tripping over things and is ready for some help. Most of us lead regular, happy lives. After doing a presentation about my vision at my niece’s school recently, a couple of her classmates came up to her at recess and said, “We feel so bad for your aunt! It’s so sad, and we almost cried during her talk!” Hearing this made me feel like I didn’t really do a great job conveying how much I love my life during my presentation. It made me decide to start my school presentations by telling the kids to smile and laugh because my story is not a sad one. Yes, I have dealt with my share of sadness over having RP. No one likes the idea of losing one of the 5 senses, especially the one that society places the most importance on, but sadness is definitely not the word that comes up for me when thinking about my life. Challenge? Sure. Adventure? Yep. Fringe benefits? Yes please. Joy? Absolutely.